Cruising is always a nice thing, but in summer the inside of the boat often gets too hot; we are already used to air-conditioning in our car, offices, hotels: why waste a nice day? Ideal for boats of all sizes, Marine Air climate systems from Climma give that "large boat" feeling of comfort and luxury. Climma started building air conditioning systems for boats in 1978, and thousands of pleasure boats throughout the world are equipped with Climma Systems. Peak Marine offers the complete line of Climma from compact DX self-con-tained units to DX split systems to multi-ton chilled water systems for super yachts and large vessels. 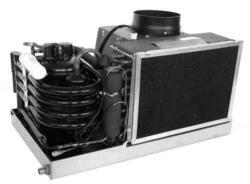 Climma air conditioning systems ensure a com-fortable onboard climate year round. The Climma trade mark identifies marine air-conditioning from Veco, with parts and systems for yachts from 25 to 250 ft.